Beautiful. The orange is gone. Simply awesome! Great! It’s great that you listened to users feedback. Now it looks even better. Nice work. The Toggle Button on the Mac has poor contrast though. As I mentioned below we had not turned on Native LCD for windows, I just noticed last night. That will be fixed in next build. 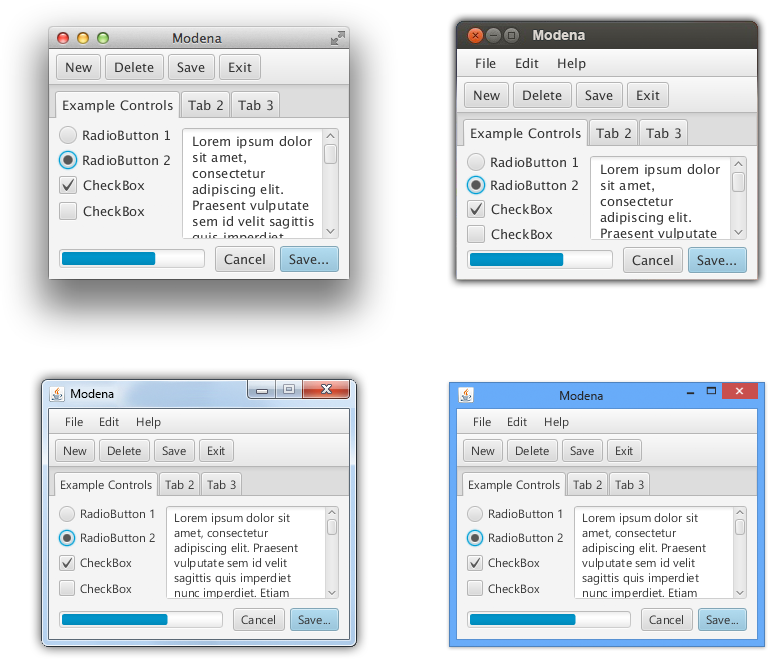 For Mac we are working on Native text rendering but I am not sure when it will be finished yet. In general very nice, but still the too rounded corners for the buttons. Yes finally the blue one i loved it . But still TableView sort icon is something not natural and Tabs too. The gradient on the table header is a bit too much now. And the arrow is a bit to “pointy”. The jury is out if the dots adds value but they are not centered over the arrow. Make sure it’s easy to turn them off. It would look better if there was one gradient in the header even if the header has multiple rows. I would like to see if the gray selection rows in lists and tables would look better if they were slightly lighter. Maybe 220. I would add a very subtle shadow (Like on Titled Pane) on bottom placed tabs. The shape indicate they are sunken and light comes from the top but this isn’t reflected in the upper part of the tabs. Tabs that are on the left or right should have very little gradient since the lighting comes from the top, not the side. is nt javafx using the native font subpixel rendering on windows? I just found out yesterday that we had not turned LCD on for Windows with Modena. We will have native LCD subpixel text on Windows. And one more thought, please. Is it alarming, that javafx 8 loads a lot of swing|awt stuff, while 2.2.6 loaded nothing? Thanks anatoliy, I’ve commented on the issue. Much better. One thing is the ‘check’ symbol looks quite weird to me. Thanks for listening to feedback. default width for menus is small and does not show menu text. Modena App shows “F…” instead of “Font” in menu for me on windows. and I get java.lang.OutOfMemoryError: Java heap space error in switching between caspian to modena theme in Modena App. Beautiful. Really beautiful. Keep going! Thanks for removing the orange! That was my biggest gripe. Along with the absurdly rounded corners being removed, I really like it. Simply awesome.. way to go javafx. It looks fantastic! But what about functionality? Do we have dialog boxes yet? A replacement for JOptionPane? Very nice indeed. Imho a significant improvement over the last draft. Kudos as well for listening to the feedback! But it is better if the color, the theme use the theme that the OS use. For example, user maybe change the OS theme at different time.we can read the os theme through jni(or JNA), then use the theme to render the javafx theme, it will make javafx have a native looking. Are those “nice colors” and “greys” (the greyscale going from 0%, 10%, 20%, to 100%) part of some palette ? How does someone use them ? will give you a dark grey button. The base color is inherited so if you set it on a parent node eg TooBar then it will effect the color of that panel and all its children. Nice! Continue this work, looks great out of the box. Far more beautiful than Java Swing. This is beautiful! Amazing Job! awesome work guys! unlike microsoft, you are actually listening to your customers / developers! thanks! This looks really sleek. Nice, clean and modern. Great Job! I can’t make sense of two elements in the above list. a) What is an indeterminate checkbox? Standard usage is that a checkbox is either selected or it’s not, there’s no middle ground. What is the use case for an indeterminate variant? b) What is a selected toggle button? A button that’s depressed is “armed”, and a button that we selected via JS or via the tab key, or possibly by clicking it, is “focused”. But what is “selected”? It look really nice, I love the javaFX new styling but i made POS in javaFX its garbage collection is very pure and memory is exhausting after 10 to 15 scene change. So i redesign it back to Swing. But still i love javaFX. My mind says if java is still with Sun Microsystems we never face such an issue.